What could you accomplish if your entire team was focused on the same thing, moving in the same direction toward a shared destination? Unfortunately, many times our teams act like they aren’t even using the same roadmap, and are afraid to stop & ask for directions. It is our job as leaders to lay the foundation for the road ahead for our teams & organizations. This shouldn’t be a solo task, however. The best team roadmap is the one that the entire team is a part of creating. Through our Innovation Workshops, we work with your team and lead them in a one- or two-day team-based discovery process … guiding you in asking the right questions and establishing common innovation goals to move toward together. Afterwards, we compile everything that was discussed and learned through the workshop and create a customized Team Innovation Roadmap with immediate, short-, and long-term innovation goals to insure that your team continues down the same path together. Our one day workshops are designed to be the catalyst for ideation & innovation with your team. We spend time getting to know each of your key team members with conversations focused on knowing them, hearing their passions in their work, and gathering insights into potential innovation areas. In the afternoon we spend a few hours with the entire team walking through a time of identifying the strength areas of your organization & the team, what’s working incredibly well in pushing you toward your vision, and areas that could be improved. We organize and compile everything that was learned during our conversations, ideation sessions, and time with your team, and use it to craft your customized Team Innovation Roadmap. 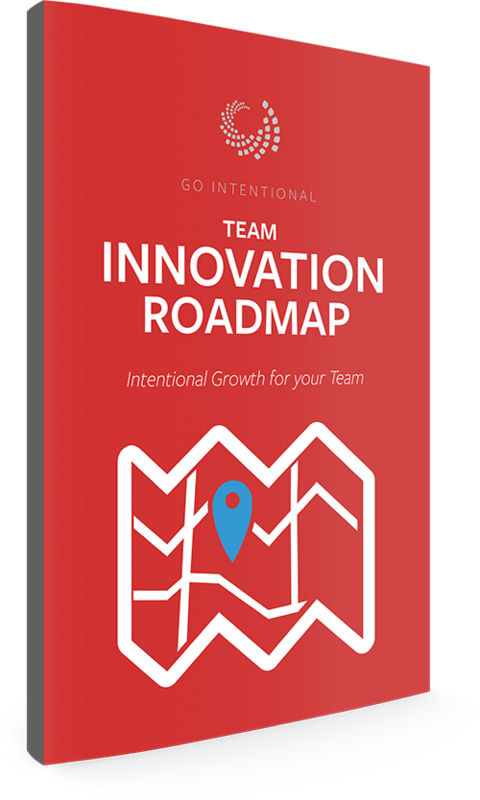 This multi-page guide lays out immediate, short-, and long-term innovation goals for your team/organization, and will act as the ‘first step’ of moving toward what was discovered collectively. We value relationship before opportunity. Our two-day workshops are designed to dive deeper by creating a 24-hour innovation process that is proven to not only ideate around innovative ideas and strategies, but to lead your team further in the discovery process in creating next steps to drive progress. We’ll spend the same time with your key team members as with our one day offering. Lunch will then kick off an internal “Innovation Day” within your team/organization that will carry through the afternoon and the following morning. The experience ends with a celebration lunch where teams are able to share the ideas that were generated. Provides an opportunity to take key ideas that the executive team/leadership has been thinking about and gather the entire team to work deeper through them to come up with next steps. Gives the team a break from their ‘normal’ workday in an atmosphere that is fun and creative. Allows focused attention on ideas that are identified as important and moves those ideas further down the road to reality. We want to help you and your organization become better! Use the form to inquire about bringing an Innovation Workshop to your team!